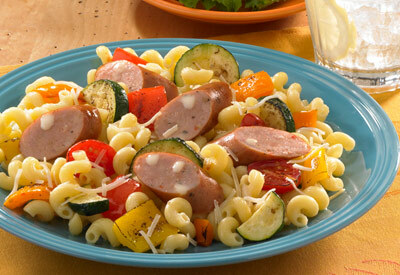 The rich flavors of oven-roasted veggies and sliced chicken sausage are tossed with linguine and topped with grated Parmesan cheese in this fast and delicious one dish meal. In a large bowl, combine the zucchini, mushrooms, tomatoes, onion and bell pepper. Add the oil, salt and pepper; toss to coat. Transfer to a greased shallow baking pan. Bake for 30 minutes or until vegetables are tender and lightly browned, stirring occasionally. Sprinkle sausage over vegetables. Bake 5 minutes longer or until sausage is heated through. Meanwhile, cook linguine according to package directions; drain and place in a large bowl. Add sausage mixture and toss. Sprinkle with Parmesan cheese. Save $2.00 on ONE (1) Huggies® Diapers package (10 ct. or larger).